Well this has been an interesting week… What I lost in steps, I made up for in sleep. I mentioned in last week’s recap that I woke up to vertigo on Sunday morning and that I’d had a pretty rough day. It seems that if I slept well, I felt weird and icky during the day, and if I had a room-spinning-kind-of-night, my following day went pretty well. Go figure. During the week I kept thinking I’d feel better soon, so I didn’t call my doctor until Thursday, and couldn’t get an appointment until this coming Thursday. Of course, if things had gotten bad enough, I could have gone to urgent care. Compared to a month-long episode of severe vertigo that one of my aunts had, mine has been a walk in the park. The week was a blur (pun intended), yet I managed to get some workouts in, and somehow didn’t have to cancel on any clients. My week was filled with sleeping late when I could, taking mid-day naps, and catching up on some reading. Even if the room wasn’t spinning, I felt odd. I told Bill that I felt like my head was empty. Yes, I set him up for a home run, but fortunately, he was kind and didn’t take the pitch. Over the course of the week I tried a variety of home remedies I found on YouTube or that my clients told me about; however, it wasn’t until Friday that I realized that I had been treating the wrong ear. Go me! The first remedy I tried was mentioned on WebMD. It’s called the Epley Maneuver and when I tried it, I immediately threw up – violently. My poor husband was holding my head, and a bucket just in case. That’s true love right there. The second home treatment I tried I named the Betty Flop, because my client Betty told me that her doctor had recommended it when she’d had vertigo. Sitting on a sofa or bed, I’d fall over onto my side hoping to reposition those pesky crystals. On Thursday, another client told me about the Half Summersault treatment invented by Colorado based ENT Dr. Carol Foster, so I gave it a try, too. After a horrible night’s sleep with the room spinning anytime I moved, I woke on Friday feeling great. I even managed a three-minute plank with one of my clients with no ill effects from holding my head face down parallel to the ground. For the second time of the week, I hopped on my spin bike and got some miles in on Friday afternoon. I didn’t want to head outside in case I had a dizzy spell and fell, and I didn’t dare get on my treadmill. My bike seemed like a safe place to get my legs moving after almost a week of practically no cardio exercise. 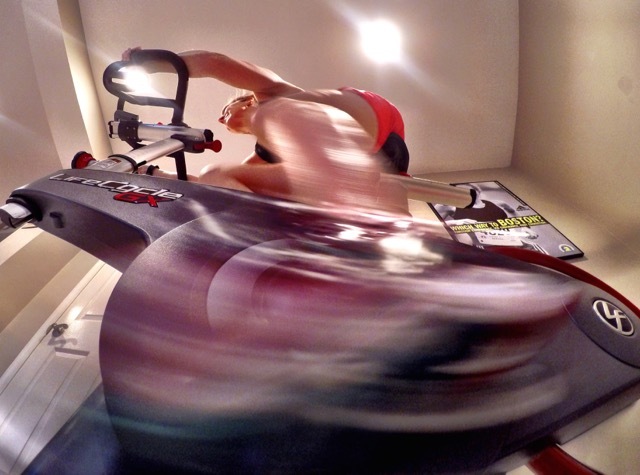 During my workout, I captured another plank by attaching my GoPro Splat flexible tripod (affiliate link) to my chin-up bar for a fun new angle for taking workout pictures in my gym. I know I’m nerdy, but new GoPro toys are the best! 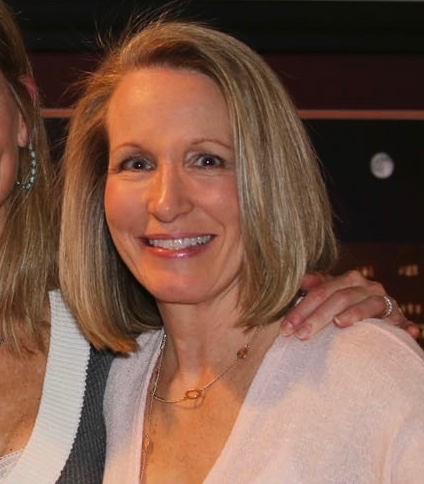 After watching the Half Summersault video several times again on Friday afternoon, I realized that at 1:50 when discussing which way to turn your head, Dr. Foster explains how to determine which ear has the dislodged crystals. That’s when I realized that I’d been treating the wrong ear… I started the summersault all over again, correcting my mistake. 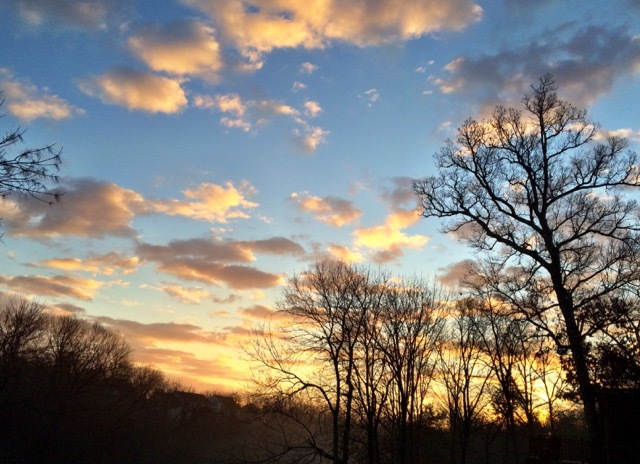 Saturday morning I awoke to a gorgeous sky, and despite feeling dizzy, decided to meet the Cruisers for a run. My friends Shawn and Alan picked me us since I didn’t feel comfortable driving. In fact, I haven’t driven in over a week. My Cruiser friends are getting used to my need for pre-run selfies and humor me. We had a new Cruiser join us today brining us up to about fifty members; although, many train closer to their homes and don’t meet for our weekly runs. 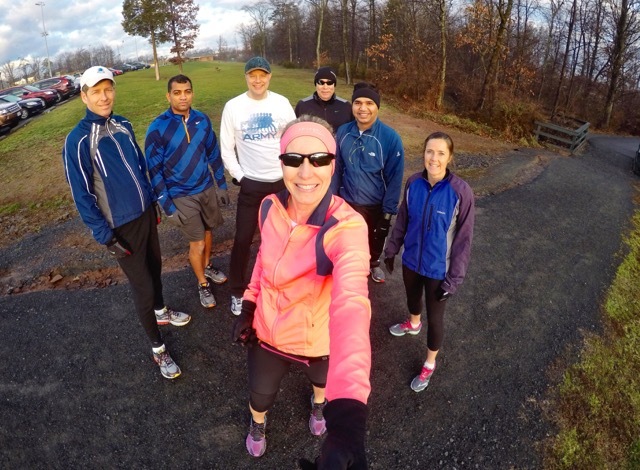 Yes, the Cruisers are getting used to my GoPro shenanigans and they’re learning to smile at all times during our runs! After the first mile, Joe and I decided to run/walk. 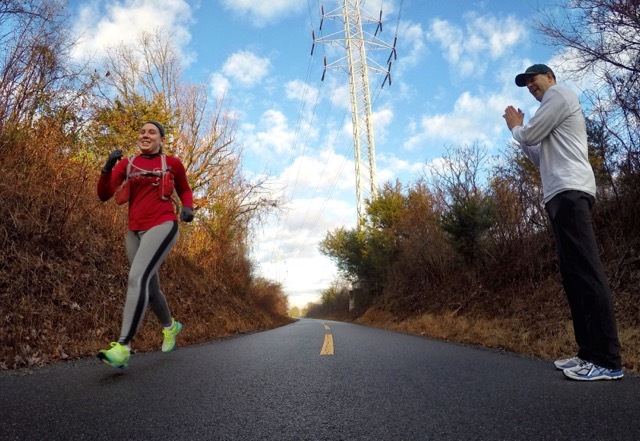 We saw my MRTT friend Jackie running toward us so I lowered my GoPro for an action shot. It wasn’t until later that I noticed that Joe was cheering her on as she ran by! 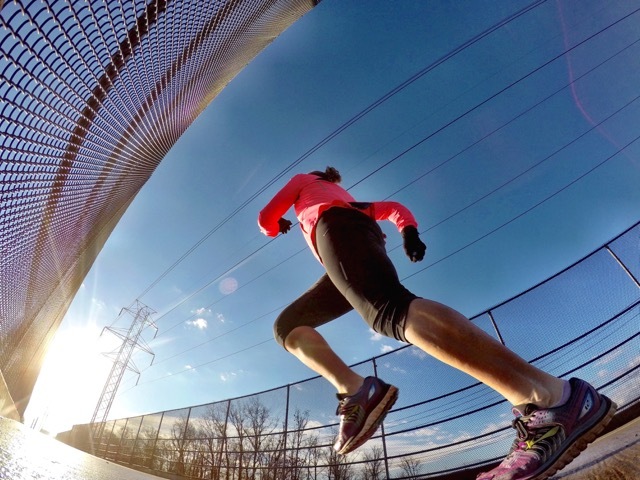 After our run, I played around with my GoPro a little more on one of the bridge overpasses before running home. If you survived my wordy recap, congrats! Here’s hoping you never have to put any of the information you learned today about vertigo to use! What non-running related illnesses have kept you off the running trail? Quantity Over Quality, Can It Work? This just sounds horrible. I hate that room spinning feeling as it is always associated with nausea for me. I hope the displaced crystals find their home soon. I almost bet they will just in time for your doctor’s visit. Isn’t that always the case? Let’s hope your hair dryer flip already did the trick. Also, I love your GoPro pics. The fence looks very interesting. Thanks for linking with us Deb! Hope you feel better soon. I have not had vertigo but I had a coworker who struggled with it for a while. She actually fell out of a chair while sitting at the doctors office which was a funny story although it wasn’t a funny situation. I think she eventually had some sort of inversion therapy done that got it to go away but it was really a hassle. Good luck – I hope yours is much simpler to resolve. I had vertigo a few months ago and it was so annoying! I’ve had it a few times in the past couple of years. I have no wisdom. It just goes away on it’s own. I’m now on day two of feeling back to normal. I read that women over fifty are most susceptible at getting vertigo – yipee. A friend of mine suffers from vertigo – he hasn’t had an episode in a while but it’s never pleasant when he does. I am prone to sinus infections – I usually get 2-3 a year. Winter is worse than summer – when I get one, that’s it, I can’t do anything and I usually have to take antibiotics – so that ends up keeping me off the roads and out of the pool for 4-5 days. Boo. I used to get sinus infections somewhat often, but haven’t had one in quite sometime. They are no fun! Hope you stay healthy this winter! Thanks, I’m feeling so much better. Hope you are, too! The head flip makes me think of that scene in legally blonde where she’s at the salon and instructing on the “bend…and SNAP” maneuver! I hope the vertigo goes away. I’m right there with you on the GoPro toys – it sure is fun experimenting with photography! HaHa, now I want to re-watch Legally Blonde! Ugh. I had several spells of vertigo when I was pregnant …. 22 years ago. And then I had one in November. I’m not sure if this was the cause because they resolved pretty quickly. Oh wow, I feel fortunate to have made it so many years before I had my first episodes. Here’s hoping neither of us has another one anytime soon! I have never had vertigo (knocking LOUDLY-and with great force- on wood). I have heard that it’s almost a nightmare…….UGH. Hope your situation improves 😉 My weather in Iowa? COLD, but with plentiful sunshine so it’s manageable. 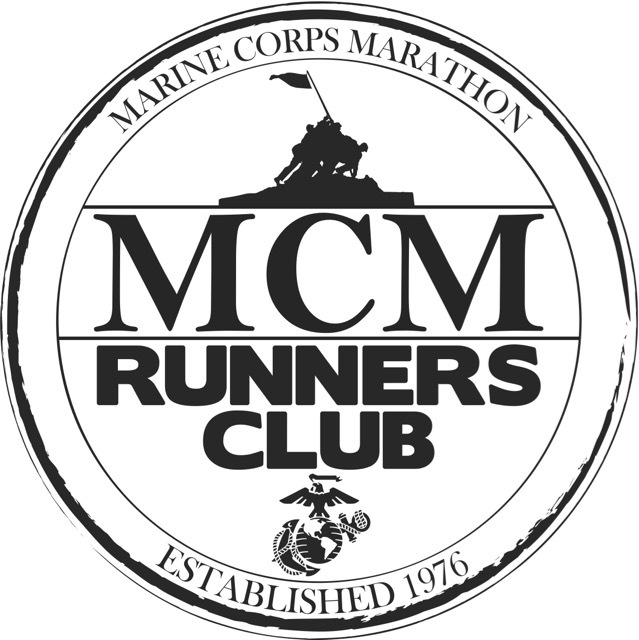 NO racing for me since my Cali trip…but there is a nearby 5K I might on-site register and do next weekend. Keep knocking on wood because it’s no fun! I just heard that we might get a big snowfall on Friday/Saturday. I’m pretty pumped! oh wow that sounds pretty scary actually! I hope you are feeling back to yourself this week. A good friend of mine deals with bouts of vertigo – so tough to deal with! I hope it goes away soon. Your GoPro pics are great! Thank you! I love finishing up a good run with some fun pics on my GoPro. Vertigo can be scary, hopefully things don’t last too long. Glad you were able to get out with the cruisers. That go pro angle is awesome. I need to get one of those bad, they are amazing for running adventures. Hello from the linkup! Wow, that is really scary! Good that you played it safe and still got in some workouts. Love all the GoPro shots! I would love to get on and play with it someday. BTW, you would love having a GoPro. It’s much more fun than I ever thought. Just hopping over from the weekly wrap! The BPPV sounds horrid! I have had a couple friends that have dealt with that or something like it, I am hoping I never do. I hope that resolves for you. 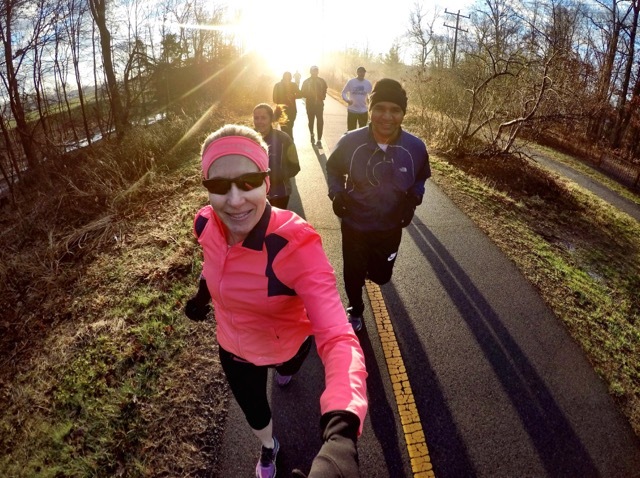 Your GoPro takes some awesome running pictures! Glad you were able to get in a good run! Glad you like my GoPro pictures! Thank you! I know vertigo can be a huge problem and thankfully have never experienced it. By I will definitely keep the “hair dry flip” in mind just in case! Glad you were able to get out for a group run. Those always make you feel so much better being outside and with friends. I would say that a run/walk totally counts as a run! 🙂 So glad your vertigo is better for the time being, and I hope it will be permanent! My friend has the exact same problem you do. I will definitely forward the video to her. I have a slight case of it (although it’s never been diagnosed). I’ve never had the nighttime spinning but when I lay my head flat I feel dizzy and sick. Tilting it back is even worse. When I go to my weekly circuit training class I have to bring a pillow for when we’re lying on the floor doing ab workouts, and then I have to get up by rolling to the side first instead of sitting straight up. Thanks for sharing! It’s good that you’ve figured out what helps keep you from having an episode. I hope the video helps your friend! Keep me posted. I’ve had vertigo before and was prescribed AntiVert. They found mine was related to Hypoglycemia and was occurring when my blood sugar was low. I’m glad yours was better by the end of the week. Hope you continue to feel better. That is no fun! Great job staying active despite not feeling well most of the week. As always your GoPro shots are amazing! Are you able to avoid onsets of vertigo by carefully controlling your blood sugar levels? 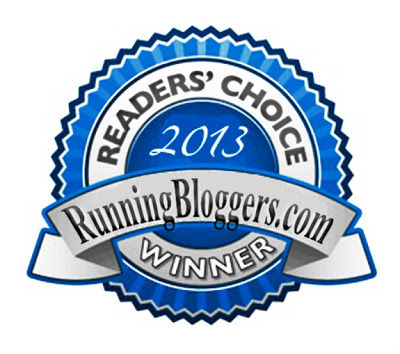 And thanks – I do love taking running pictures with my GoPro! Oh, I hope you are feeling better. Be safe ! I would have stayed off my bike too. Fingers crossed things improve soon. Thank you! I feel so much better and have since Saturday afternoon. BTW, I only got on my bike during times that I was feeling pretty good and not at all dizzy. I’ve never had vertigo, but now I know who to come to if I ever do! I’m sorry it lasted so long, Debbie, and I hope your blow dryer cure sticks. And I love your GoPro shots – you must be having a ball playing with it! Thanks, Dana; and yes, I have a blast playing with my GoPro! I have never had this but I know I hate the times I did feel dizzy even for just a moment! I have a friend that has it and she can hardly put her head down without it affecting her. Sometimes are worse than others though. I was glad to read yours was better later. Hey I bought me a tripod coming for my phone, Maybe I can get some of the awesome pictures like you! Ugh I know the feeling all too well and I’m glad to hear you made it through to the other side. Some weeks are downright awful and it’s nice to just put them away and never think about them again. That vertigo sounds so awful! The only point of reference I have for it involves alcohol, but they don’t sound much different. I hope you have continued to feel better this past week. Maybe you’ve got it figured out with that hair dryer flip! Last winter I struggled with a string of sinus infections that seemed to go on and on from November through March. That definitely kept me from running as much as I would have liked. I tried to ‘run through’ it a few times, but when I found out from my doctor that I was on the brink of pneumonia. I didn’t try to push it after that.